Your furry feline friend needs to be taken care of during an emergency also. Instead of running around trying to put a kit together, you can grab this backpack already filled with many useful items you will need to care for your kitty. 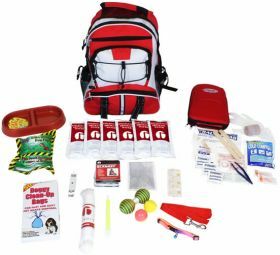 This feline survival kit was designed using advice from experts in the emergency preparedness industry. It follows guidelines given by government agencies and non-profit preparedness organizations. This pack has a retail value of $85.